Rediff.com » News » What's that 'strange thing' in Alaska river? What's that 'strange thing' in Alaska river? A video captured in Fairbanks, Alaska, showing a strange "thing" swimming in the Chena River, has set the Internet on fire. 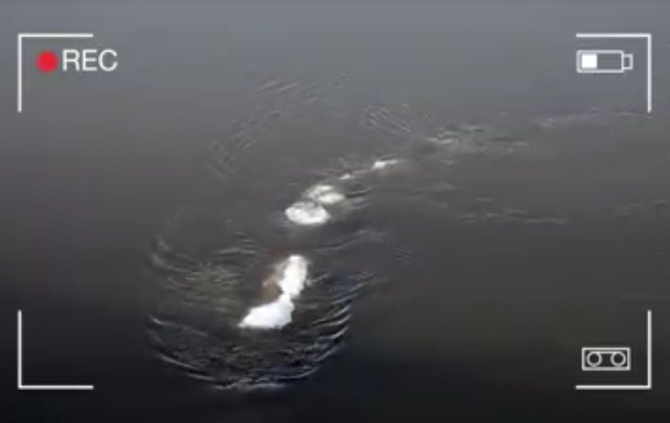 Craig McCaa, who works for the Bureau of Land Management in Fairbanks, recorded the movement of a mysterious object (or creature) in the Chena River. Speaking with Alaska Dispatch News, Craig McCaa said he spotted the "thing" when he was taking photos of the ice forming on the river. "It never fully revealed itself," the bureau employee told the newspaper. "I initially thought, and several people thought, it could be some rope that snagged on the bottom of the river with chunks of ice. Other people have mentioned everything from sea monster to giant sturgeon," McCaa said. Online guesses to the identity of the "strange thing" have ranged from it being a "zombie salmon" to a mysterious beast deemed "The Chena Chomper". Speculations aside, however, the Alaska Department of Fish and Game Tanana River Management seemed to have a clear idea what it was looking at. Biologist Klaus Wuttig said it's probably just a rope stuck to a bridge pier. He said cold temperatures at night allowed frazil ice -- a kind of loose, slushy ice that forms on water -- to stick to the rope, which caused it to float to the surface. "It looks like it's swimming but it's actually stationary and just wading in the current," Wuttig said. Though Bureau of Land Management officials admit to adding music and adjusting the speed of the video, they maintain that what was spotted in the river is real. Take a bow, Sonali Bendre Behl!